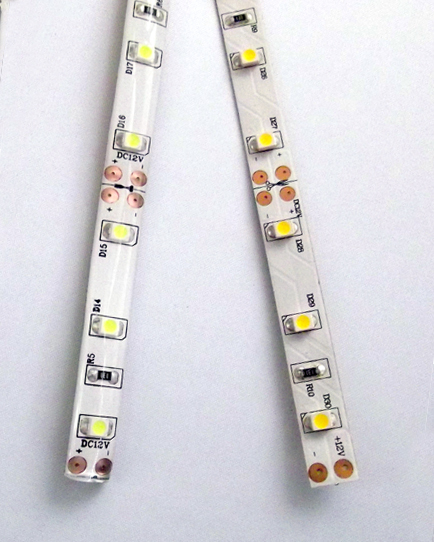 This hi-brightness flexible strip light has 60 LEDS/m and connection/cutting points every 50mm. An IP65 rated version is also available with a crystal clear polyurethane coating which prevents yellowing over time. Both types come with a high quality 5M double sided adhesive on the rear face. Led-Zip use a white coloured circuit board for extra reflection. The tape is supplied on 5m reels but smaller lengths can be cut to order. Led-Zip offer a cutting/connection service separately, please contact the office for details. This product is available in COOL WHITE, WARM WHITE, RED, BLUE, GREEN and AMBER.